Whitehall Villa Nova Lawn Sign with Your Street Address - - 23.5 x 13.5 (estate size) with two lines of text. Line 1 holds up to 5 numerals; line 2 holds up to 17 characters. Line 1 characters are 4.5" high. Line 2 characters are 2" high. 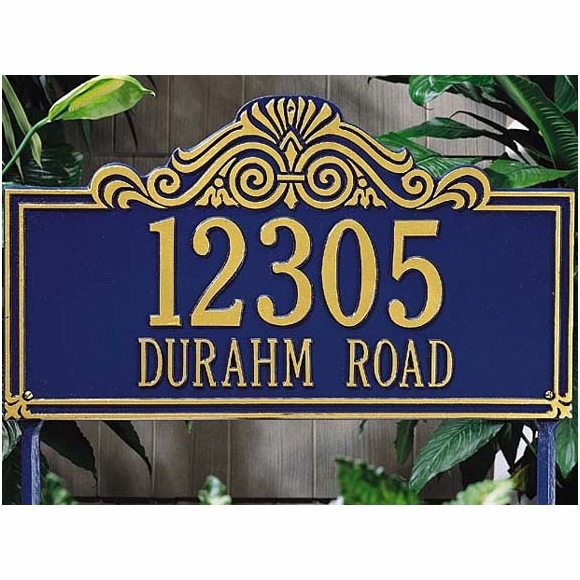 Estate size lawn marker address plaque measures 23.5" x 13.5" and comes with two 18" stakes. Colors: AB antique brass, AC antique copper, BG black/gold, WG white/gold, OB oil rubbed bronze, OG bronze/gold, PS pewter/silver, GG green/gold, RG red/gold, BS black/silver, BW black/white. Made for you in the USA. 5-year mfg. warranty. Please allow 2 to 3 weeks for delivery.